Sleeps ten in beds and up to 14 using aero (inflatable) beds. This two story home combines our 2300 sq. ft. Oceanview Three Bedroom Two Bath upstairs with our 1350 sq. 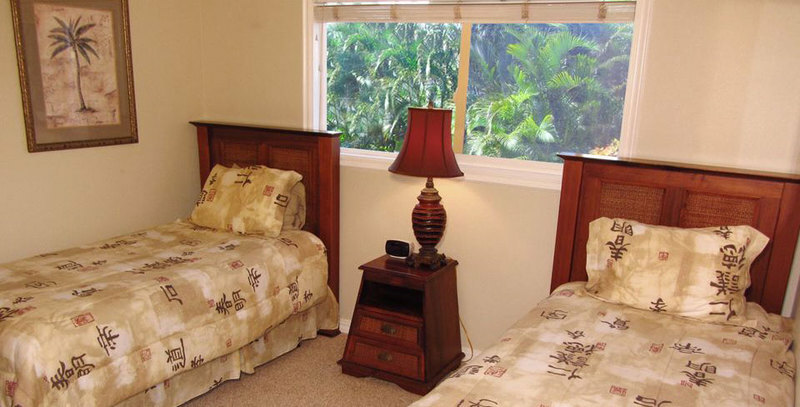 ft Aloha Two Bedroom Two Bath downstairs. They connect by an internal staircase and each also has a separate entrance. Air conditioning and ceiling fans in all five bedrooms. Two master suites, one upstairs and one downstairs. The living rooms, dining rooms and kitchens all have numerous ceiling fans. Eight foot sliding glass doors in two directions provide excellent cross ventilation. Oak hardwood flooring in entry, living room, dining room and kitchen. Berber carpeting in bedrooms. Tile floors in baths. Granite counters in both kitchens and all baths. 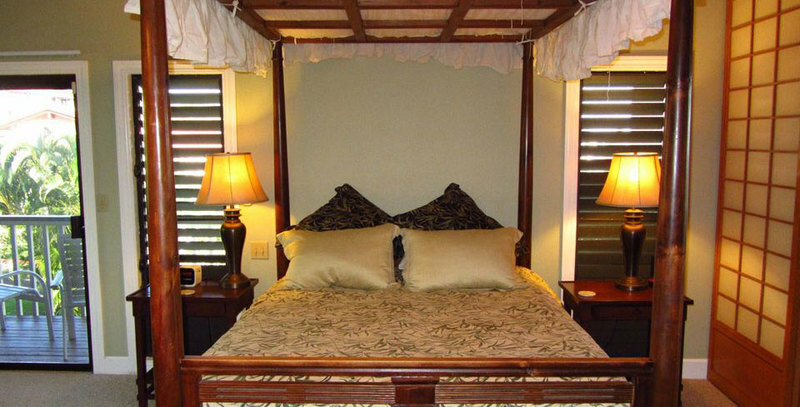 Upstairs the master bedroom has a queen canopy bed with pillow top mattress and Egyptian cotton linens plus a private covered lanai with seating for two. The master bath has a deep soak tub with two shower heads and double sinks. The second bedroom has a queen sleigh bed with a pillow top mattress and Egyptian cotton linens. The second bath has a deep soak tub and shower plus double sinks. The third bedroom has twin beds. Downstairs the master bedroom has a queen bed and a slider to the outside covered lanai. The master bath has a large Jacuzzi tub and double sinks. Two large full kitchens with double door refrigerators with ice makers and water in the door. Ceramic top stoves with ovens. Full sets of pots and pans, dishes, glasses and stemware. Upstairs dining table seats eight and downstairs seats six with four bar stools. Two covered lanais each has outdoor dining tables for six and gas barbecues. Fifty inch HDTVs in upstairs and downstairs living rooms and HDTVs in all five bedrooms. Beach towels, beach chairs and coolers provided. Snorkel gear, boogie boards, underwater camera snorkel masks and beach umbrellas may be rented in advance and waiting for you upon arrival. - Queen four-poster canopy queen bed in master up. - Queen bed in second bedroom upstairs. - Twin beds in third bedroom upstairs. - Upstairs & downstairs levels. - Queen carved pineapple bed in downstairs master. - Twin beds in downstairs fifth bedroom. - Berber carpeting in bedrooms. 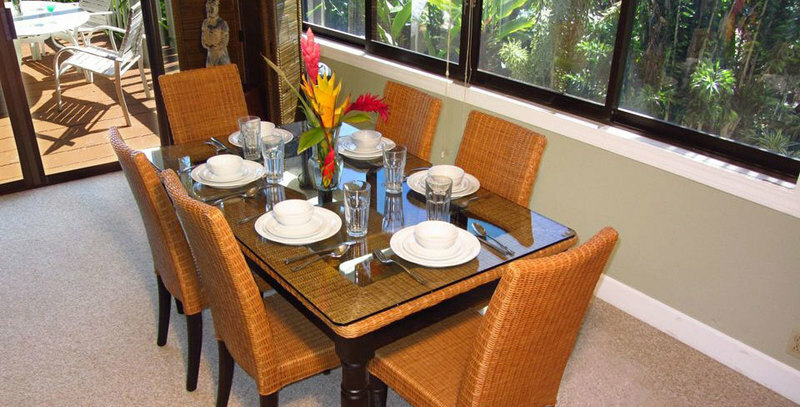 - 3 large lanais, two with outdoor dining. - Two separate living & dining rooms. - Two stainless steel barbecues with side burners. - Baths with deep soak tubs, double sinks, and large oval Jacuzzi tub. - Inflatable beds, linens & towels available for additional occupancy. - Hardwood flooring in living, dining and kitchen areas. 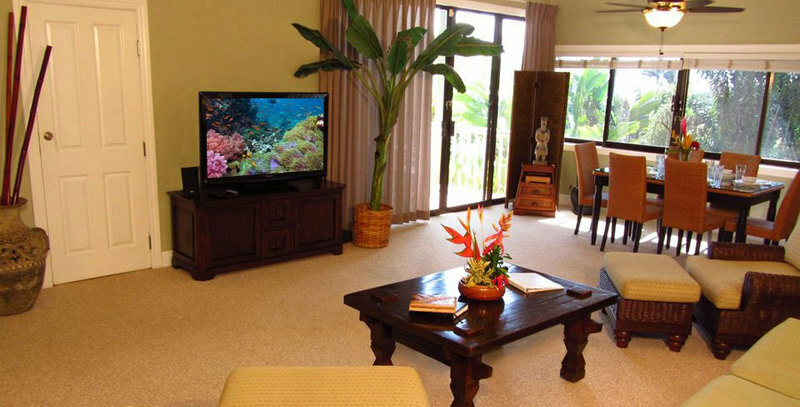 - Combines Oceanview Three Bedroom, Two Bath and Aloha Two Bedroom, Two Bath.